BM Stafford, one of Palletforce’s newest members, are demonstrating their commitment to the network by investing in Palletforce branded vehicles. The company, who joined the palletised distribution network earlier this year, have added Palletforce-branded Montracon trailers to their fleet following an upturn in volume. Mark Stafford, Director at BM Stafford, said: “We predicted that joining a quality network like Palletforce would lead to a massive increase in volume for us and that is exactly what we have experienced. 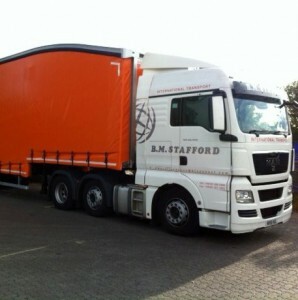 As well as adding new trailers to the fleet, BM Stafford have also refurbished existing trailers in Palletforce livery. Dave Holland, Sales and Marketing Director of Palletforce, added: “We were thrilled to welcome BM Stafford as one of many the members that have joined Palletforce this year.